The UK Government must address decarbonising heat “urgently” as it has not yet been tackled effectively. That’s according to trade body Energy UK, which has set out the industry’s vision and provided recommendations that government should consider as a minimum necessary to set the country on track to deliver its fifth carbon budget. It identifies heat as the biggest challenge for decarbonisation at a large scale and one that needs “clear direction” from government. It suggests funding pilot schemes and research to identify “regret routes” to decarbonising heat and understanding each technology’s pros and cons for the different types of buildings. The report adds government should encourage the uptake of low carbon heat technologies in commercial buildings through attractive financial and tax incentives to help manage upfront capital costs and reduce district heating business rates. It states government should engage with local authorities now on the challenge of decarbonising heat as they will have a vital role to play. Energy UK also believes the decarbonisation of heat is “likely to require” carbon capture and storage (CCS) if hydrogen emerges as a viable option and is calling for a “clear indication” of government’s views on CCS. It adds failure to deliver on the recommendations could lead to carbon reduction targets not being met and higher decarbonisation costs in other sectors as heat is not sufficiently decarbonised. Read more at Energy Live News. Public sector organisations in England and Wales are about to benefit from £320M of support from the Government to decarbonise building heating systems. The Heat Networks Investment Project (HNIP) is due to enter its main funding phase in 2017 and Metropolitan, the leading independent district energy and multi-utility infrastructure provider, is using its expertise to meet this new demand for sustainable, low-carbon district energy systems. Both the UK and Scottish Governments have made available funding for district energy systems through The HNIP in England and Wales and the District Heating Loan Fund (DHF) in Scotland. This means that local authorities and other public sector organisations, such as NHS Trusts and universities, are opting to incorporate district energy systems into new developments. Metropolitan has a strong track record in this field having delivered the low-carbon energy centre for the landmark urban regeneration, Kings Cross Development in London, and is ideally placed to meet the needs of public- sector sustainable development. The company is committed to the highest standards of quality, service and customer protection. It was one of the first to register a scheme with the Heat Trust, the industry-led, self-regulatory initiative which recognises best practice. (For details of the scheme see Editors' Notes below). Metropolitan's focus on the public sector will be led by Dom Barton, a recent key appointment as Business Development Director. Dom has a strong background in the district energy field and in his new role will be working predominantly with public sector customers. A chartered mechanical engineer, with experience gained at SSE and British Gas, he is well placed to understand the energy needs and challenges facing public sector developments. "The public sector has an unprecedented opportunity to lead the way in low- carbon development", commented Mr Barton. "The availability of funding, backed by active Government commitment, means that projects undertaken by public-sector organisations will in future incorporate the latest, most energy-efficient systems for the benefit of whole communities. Such systems not only deliver core services and complement new housing development but also create jobs." District energy increases efficiency and can ultimately lower the cost of energy, in addition to achieving UK Government carbon targets. It is low- carbon heat, energy and cooling which is produced locally from a central energy centre, typically fuelled by gas-fired combined heat & power (CHP) engines, electric heat pumps, fuel cells or biomass boilers and distributed via a district heat network. District energy networks, such as those developed by Metropolitan, provide sustainable, future-proof solutions for high density residential and mixed-use new developments and urban regeneration areas. Metropolitan offers a one-stop service for its public-sector partners: designing, building, funding, co-owning and operating networks. As a multi-utility provider, Metropolitan can also deliver a full suite of utilities in addition to district energy networks including electricity, water, wastewater, ultrafast Fibre-to-the-Home (FTTH) and gas. Dom Barton will be building long-term relationships with public-sector partners. "Metropolitan's flexible models of co-ownership of the district energy networks it designs, installs and invests in, give our partners the reassurance of our long-term commitment to each project. We have an ongoing interest in the success of each development, continuing to manage customers' needs long after the construction phases have been completed." Bill Dewar Fife Council lead professional, Re Alan Kimmtt, Barbara Whiting Fife Council lead professional and Martha MacLachlan energy promotion and development officer. Bill Dewar Fife Council lead professional, Rev. Alan Kimmtt, Barbara Whiting Fife Council lead professional and Martha MacLachlan energy promotion and development officer. 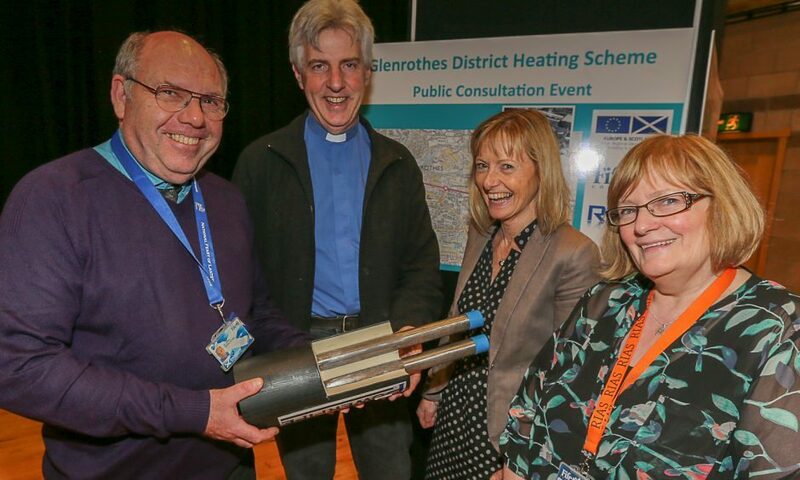 Council officials have been given the green light to draw up a final business case for the Glenrothes Next Generation District Heating Scheme (Glenrothes Heat), which will serve a number of commercial, public and residential buildings including Fife Council’s complex at Fife House and Rothesay House, and the Rothes Halls entertainment venue. An ambitious timescale has now been outlined for the project, which could see the first of 327 council homes connected to the new network as early as March 2019. Any delay might hinge on whether an environmental impact assessment is required, but the local authority remains confident that the potential impact — and any mitigating measures needed — can be dealt with as part of any detailed planning application. Public consultation is ongoing, with an all-day event being held at the Auchmuty Learning Centre on Thursday April 27, but it is hoped councillors will be in a position to give the project the final go-ahead this autumn. Glenrothes Heat will essentially construct a district heat network with an associated back-up energy centre with thermal storage to supply low carbon heat to a range of local customers. It will take advantage of the current heat capacity from the RWE Markinch biomass combined heating and power (CHP) plant, and heat could be provided to the council’s buildings at Fife House and Rothesay House as early as January 2019. A number of other users in the town centre have also been identified as potential customers, including the Rothes Halls and local library, major retailers, a social and community club and a local church, while phase two of the project will involve the connection of 372 council homes from 2019 to 2023. Further phases will also emerge as areas of Glenrothes are redeveloped, and that could see the network extend further south to serve the likes of Pitteuchar West Primary School, Fife College and the Michael Woods Sports and Leisure Centre. The total length of the entire network which includes the core network, new development, and out-of-area connections is approximately 10.5km, although plans indicate that underground pipes are likely to “make use of cheaper routes” ie along grass verges where civil engineering costs are lower and disruption to traffic can be minimised. Ofgem has warned the Scottish Government against the perils of pricing for heat networks, which could lead to “poor outcomes” for customers. In its response to a Holyrood consultation on heat and energy efficiency strategies, along with the regulation of district heating, the regulator warns customers may be “locked in to long-term contracts”, with no ability to switch and not enough information to understand their bills. It also claims customers risk being charged too much, because there are “no formalised regulations on charging”. Instead, the regulator suggests that customers connected to heat networks be “charged no more than if they were using natural gas for heating”. The consultation response also recommends giving local authorities a role in coordinating connections for heat networks. “Principles-based regulation would likely make it easier to read across arrangements from electricity and gas, which may help meet customer expectations,” the response states. The response also notes the “well documented” difficulties in securing investment for heat networks and a baseload of customers. “District heating projects currently have a higher risk profile than those across gas, electricity and water,” it notes. A Rundown estate plagued by crime will see a new energy centre built after the council was awarded a grant by the government. Marlowe Road Estate in Walthamstow is currently undergoing a £70 million regeneration and redevelopment project. Waltham Forest Council successfully bid for the £1million grant from the Department for Business, Energy and Industrial Strategy. The funding will be used to extend the low-carbon heat network on Marlowe Road and Wood Street South in Walthamstow. The network will be run from a new energy centre built on the estate, which is expected to be completed by 2019 along with the first phase of homes. The Mayor of London, Sadiq Khan, has set a target for 25 per cent of London’s heating to be provided locally from lower carbon sources by 2025, in an effort to improve air quality. Minister for Climate Change and Industry, Nick Hurd said: “Energy innovations like heat networks can cut costs for households and reduce carbon emissions, as almost half of the energy we use goes towards heating our homes and buildings.